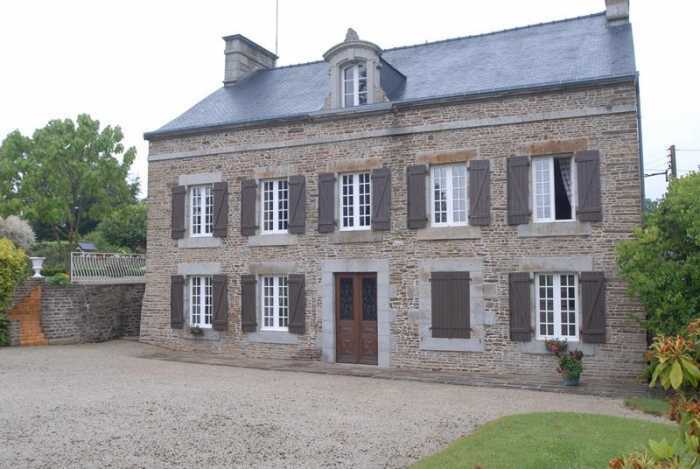 Manor house for sale in the Mayenne with over 5 acres and several outbuildings, including a tenanted studio apartment. The house is in need of further modernisation as only the first floor is being used at present but would make a substantial house once finished. The Manor house is south facing with views over well-established gardens. The oil fired boiler was replaced about 10 years ago and the roof was replaced about 20 years ago. There are some double glazed windows. The studio apartment generates a quarterly income of 640€. Viewing is highly recommended. The property is situated on the outskirts of a village where you will find an award winning boulangerie, a butcher, a post office, a bank, a supermarket with petrol station, 2 bars, a restaurant, a hairdresser and 2 brocante/second hand shops. A market is held in the village square on Friday mornings. The town of Fougeres is just 20 minutes away, and has the largest medieval château in Europe. It has many good shops, cinema and ten pin bowling. Just outside the town is the Forest of Fougeres, which has a large lake and beach. There is also horse riding in the Forest. The property has excellent transport links to the UK via the ferry ports at Calais - 4.5 hours, St Malo - 1.5 hours, Le Havre - 2.5 hours, Cherbourg - 2 hours. The airports at Rennes and Dinard are about a 1 hr 30mins drive away. The house is situated in the Pays de La Loire but travel five minutes and you can be in Normandy or Brittany. Fougeres, with its ancient belfry, many shops, bars and restaurants is 20 minutes away. The medieval town of Domfront is 30 minutes away. The UNESCO heritage site of Mont St Michel is less than an hour away. The towns of Gorron, Ernee and Mayenne are close by. The market town of St Hilaire du Harcouët is approx 15 minutes away. Half glazed double doors to the front elevation toEntrance Hall : 3.31m x 3.23m - Wood floor. Marble fireplace, Coving and ceiling rose. Wood panelling. Half glazed door to spiral stairs. Cupboards. Wood floor.Boiler Room : 6.48m x 3.36m - Door and 3 windows to the rear elevation. Electric Meter. Fireplace. Boiler.Cave : 3.96m x 3.34m - Door to rear elevation . Stone floor. Door leading to wine cellar. Living Room : 5.96m x 4.70m - Ornate ceiling. Ceiling rose. Coving. Marble fireplace. Wood floor. 2 windows to the front elevation. Part wood panelled. Games Room : 4.49m x 6.27m - 2 windows to the front elevation. Built in cupboard. Parquet floor. Marble fireplace. Part wood panelled. Ceiling Rose. Coving. On the first floor -Kitchen/Breakfast Room : 3.18m x 6.00m - Radiator. Half glazed door. 1.25 stainless steel sink with mixer tap. Space for dishwasher. Freestanding cooker. Extractor fan over. Base and Wall units. Worktops. Tiled splashback.Utility : Plumbing for washing machine. Tiled floor. Radiator. Window to the rear elevation.Cloakroom : Toilet. Hand basin. Dining Room : 4.75m x 6.00m - Marble fireplace inset. Parquet floor. Built in cupboard. 2 radiators. 2 windows to the front elevation. Built in shelves. Coving. Inner Hall : Door to stairs to loft and basement. Wood floor. Bedroom 1 : 3.25m x 3.69m - Built in cupboard. Radiator. Wood floor. En-suite shower room : Vanity with light over. Radiator. Window. Shower Unit.Bedroom 3 : 3.40m x 4.60m - Window to the rear elevation. Radiator. Bidet. Pedestal hand basin. Shower cubicle.On the second floor - Landing : Velux window to the rear elevation. Wood floor. Room : 2.45m x 1.75m - Window. Wood floor. Sloping. (This room would make an ideal en-suite bathroom).Bedroom 5 : 3.11m x 5.05m - Window. Wood floor. Hatch to loft sloping.Bedroom 6 : 5.19m x 3.26m - Window. Wood floor sloping.Bedroom 7 : 2.76m x 3.76m - Window to front elevation. Wood floor. 2 Rooms : 1.73m x 2.62m - Round window. (These rooms would make an ideal en-suite bathroom and dressing room).OUTSIDE :To the front of the property there are metal gates, a gravel drive, lawns, mature shrubs and trees. Surrounding the property are well established park style gardens. Ample tarmac parking and turning area. Vegetable garden. Paddocks to the rear and front of the property. 1 tree is over 300 years old.Separate stone building with slate roof. Old cow shed with loft over. Attached house (currently rented out to an 80 year old tenant) with 1 room downstairs and steps up to accommodation. Approx. surface area of 7.9m x 5.0m. Garage. Orchard with 40 cider apple trees. Source so you could make a pond if required, and subject to planning. Separate stone garage with shingle roof (currently rented out). Attached open fronted tractor shed. Attached to house there is a stone woodshed with slate roof. Block built 3 car garage. Large stone barn with lean-to for sheep. Mains water, electricity and telephone. Drainage is to an all water septic tank. Oil fired central heating.